When I think of making fudge or other homemade candy I think of my mother spending hours at the stove with extremely hot sugar and her always being worried about it being too hot for me to help. Recently I made a batch of old fashioned fudge and found myself with the same worries of my young children being in the kitchen. That’s when I started looking for a Chocolate Fudge recipe that would be easier to make. You are not going to believe how simple it is to make this! 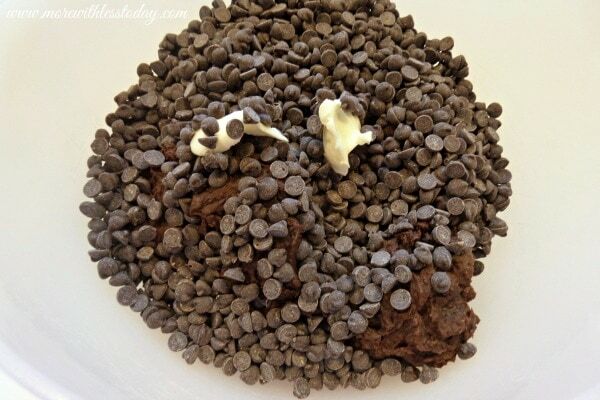 Combine the chocolate frosting, chocolate chips, and butter in a microwave safe bowl. Heat for 30 seconds in the microwave. Stir and heat for an additional 20 seconds or until the mixture is completely smooth. Let the mixture cool for several minutes. Once the mixture is cool enough to handle, begin rolling it into balls approximately 1″ in size. Place the ball onto a sheet of parchment paper and flatten slightly. Use your finger tips to square the sides as well. Let the fudge squares cool completely before adding the Candy Cane Topping. When the fudge is firm fill your piping bag with candy melt. Heat in the microwave for 25 seconds. 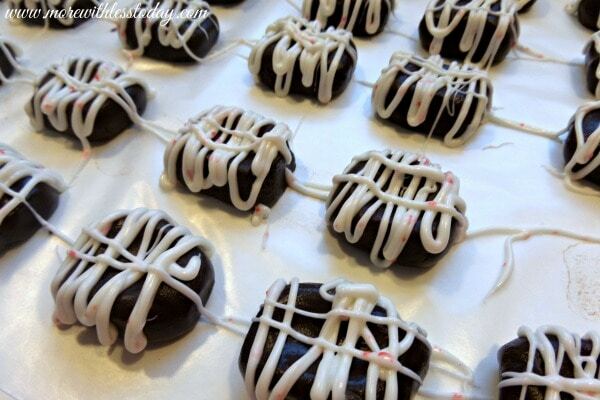 Squeeze the piping bag to mix the candy melt. Return to the microwave for an additional 25-30 seconds or until the candy completely melted. 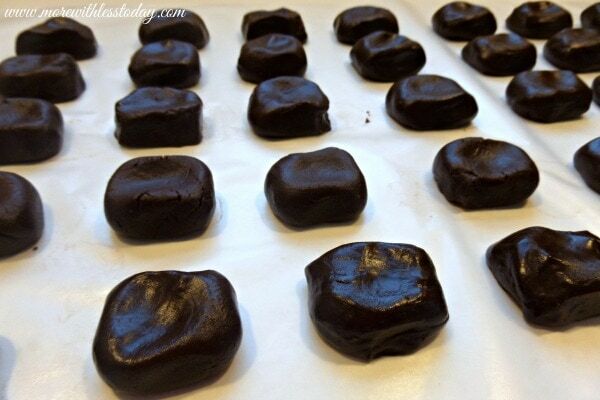 Snip the end off of the piping bag and carefully drizzle the candy melt over each fudge square. Allow the candy melt to become hard before transferring from the parchment paper to a serving dish. 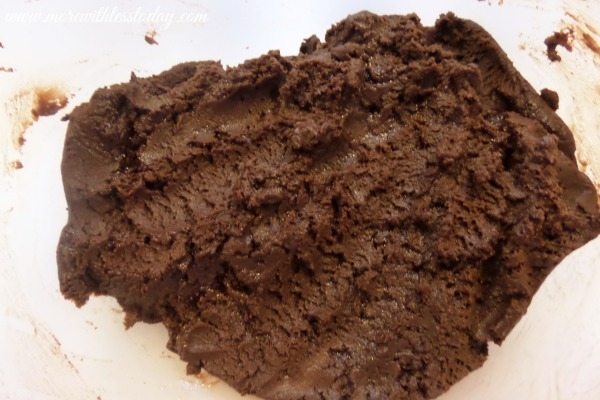 This simple chocolate fudge is creamy and delicious! 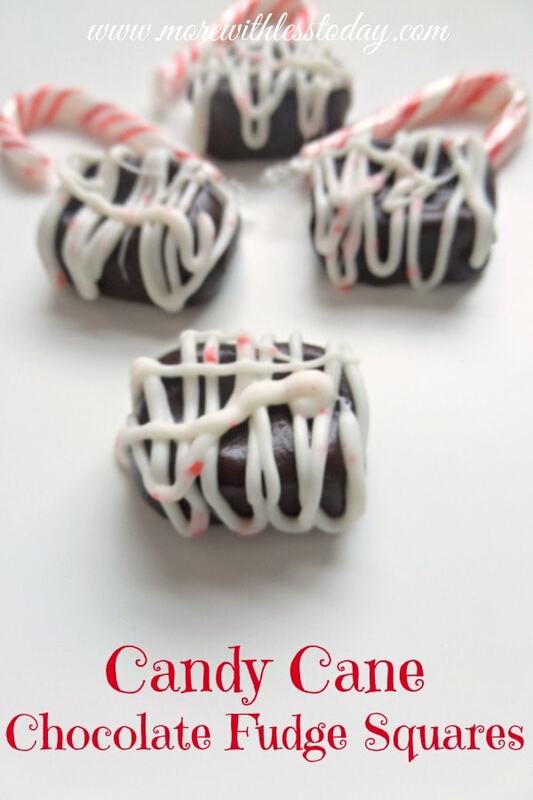 You’ll love the rich chocolate with the peppermint of the candy cane topping. We would love it if you would PIN our recipe to one of your Pinterest boards! Do you have a favorite dessert recipe to share?